As students and faculty, we are constantly on the move across campus, but while walking have you ever wondered about all the different buildings that are around us? Though Illinois Wesleyan is not a large campus, the number of buildings and their individual histories make up for its small size. The dates of acquisition and construction of each building range over time, creating a blend of older and newer buildings on campus. 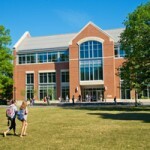 The most recent building, State Farm Hall, was finished in 2013 and replaced the Sheean library, constructed in 1968. 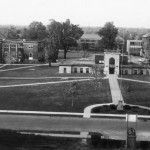 Before the Sheean and State Farm Hall, the first building on IWU’s campus, Old North Hall, was built in roughly the same area and lasted from 1856 until 1966. 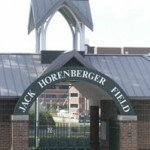 The Alumni Relations Office was created in 1991 on January 15th alongside the later dedication of well-used Baseball Field in honor of Jack Horenberger on April 11, 1999. 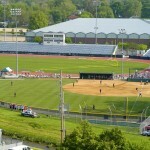 Only a year later, on April 14, 2000 the Softball Field also held its inauguration when the Titans hosted North Park. Dialing the clock only a little farther back, the records of the Physical Plant also reveal the creation of buildings such as Publications, Printing, and Mailing Services on January 3, 1996; Information Technology on August 4, 1983; and the well-known Multicultural Center on November 20, 1980. Some of the more common and well-loved buildings of campus also have long histories. 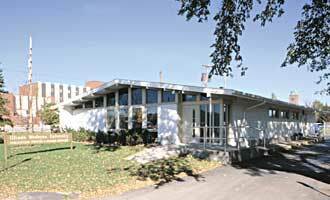 The E. Melba Johnson Kirkpatrick Laboratory, or better known by theatre goers as the Lab Theatre, is actually part of the Alice Millar Center for Fine Arts which received its dedication on March 18, 1973. It was not until the autumn of 1993 that the Lab Theatre received its name in dedication. The Memorial Center has been home to many offices, rooms, and places of events. For instance, the Bertholf Commons, the campus’s largest dining hall, can be found there. The commons was dedicated to President Bertholf, who held office between the years of 1958 and 1968. Even the International Office, which is currently located in the Center for Liberal Arts (CLA), used to be housed in the Memorial Center. Some of the oldest buildings on campus are some of the least known. 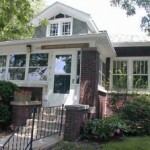 The English House was built in 1911, but was not acquired by Wesleyan until 1947. The Security office that we know today was a coach house for what is now called Blackstock Hall (acquired in 1937). The coach house has also been an art studio and the English House was once the Gallery Building. Look through the changes to our campus at the collection of historical maps online at http://collections.carli.illinois.edu/u?/iwu_histph,1185. English House. Found on the IWU website. For many of the students on campus, after a day of classes, work study jobs, extracurricular activities, and studying, we all enjoy being able to return to our various residence halls for a bit of relaxation and rest, not to mention a place to live during the school year. 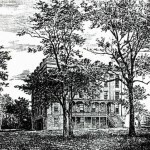 The first residence hall was built in 1878 and was known as Henrietta Hall, a residence hall for women only. It was run by a group expressly created for that purpose: the Women’s Education Association of IWU. It was also originally known as the Young Ladies’ Boarding Hall. 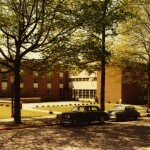 The second residence hall was Kemp Hall. 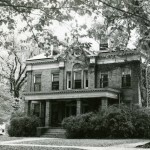 It was formerly known as the DeMange Mansion and was renamed in honor of President Kemp after it was acquired in 1912 and was also an all-women residence hall. 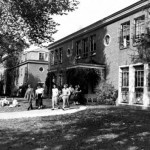 Until 1987, it also was home to a dining hall and offices for faculty members. 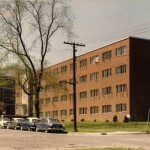 Dolan Hall – formerly Franklin Hall for Men – was built in 1955 and was one of the first dormitories established for men. Prior to this time, men either lived in fraternities or resided off campus. A new Women’s Residence Hall is opened on the corner of East and University Streets in October of 1956. We know it today as Anna Gulick Hall. At the time of opening, it was also home to “The Sarepta Bane Whipp Department of Home Economics.” See front page story in the 1956 IWU Bulletin. 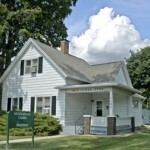 Until 1998, IWU’s Publications, Printing, and Mailing services resided in Holmes Hall. 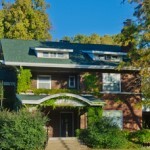 It was decided that the space was too small for the services and was moved to its current location, a small building off of Franklin Avenue nearby the TKE fraternity house. Before that, the building was actually a dentist’s office until it was acquired by Wesleyan at an unknown date. The space was vacant for sometime, and it was supposedly meant to be used as a child care facility. See the full article in the February 6,1998 IWU Argus. Publishing, Printing, and Mailing services. From the IWU website. Architectural history is alive and well on our campus, but this is only a short list of the buildings that cover the grounds. You will find photographs of these and other IWU landmarks in our online collection. 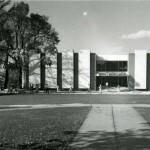 To learn more about other buildings new or old you can also visit Tate Archives and Special Collections in the Ames Library, or contact the Archives at archives@iwu.edu! This entry was posted in Campus units, Departmental histories, Research files and tagged buildings and grounds, campus changes, landscape by Meg Miner. Bookmark the permalink.